The 2020 Ford Mustang Shelby GT500 is definitely at the center of all the muscle/pony car limelight at the moment having been launched at the 2019 North American International Auto Show, Detroit recently. On top of this the first production build slot has been auctioned with the VIN number ending 001 at Barrett-Jackson, Scottsdale for $1.1 million. 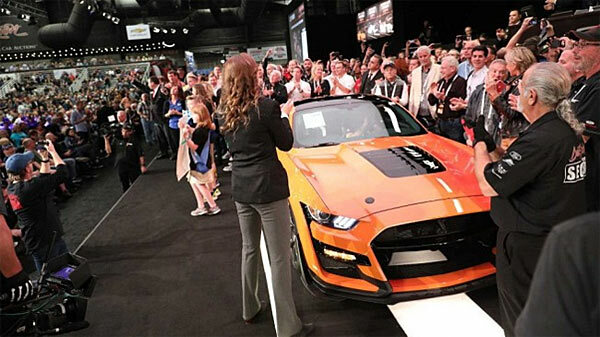 The car was bought my Barrett Jackson’s CEO and chairman Craig Jackson, with Edsel Ford II and Aaron Shelby, grandson of the late Carroll Shelby present at the auction making it quite the historical event. All the money raised will go to JDRF, a research foundation for the cure of diabetes. The 2020 Shelby GT500 will sport a 5.2-liter supercharged V8, 2.65-liter Eaton blower with 12psi, Tremec 7-speed dual-clutch transmission and not confirmed yet 700+ horsepower. Performance figures are predicted to be a quarter-mile in under 11 seconds and 0-60 mph in around 3 seconds. The car is also planned to be the most track ready and powerful GT500s yet. The new GT500 is planned to go on public sale this fall, with final specs and price coming nearer the time of release.